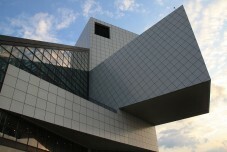 The Rydt Entertainment division of MiT provided a comprehensive solution to re-model the Rock and Roll Hall of Fame’s Gregg Foster Theatre. In addition to a high-tech update to the projection and sound, new seats, wall finishes and other cosmetic improvements were made to the facility. © 2014 Moving Image Technologies. All Rights Reserved.